This is the story of Comrade September, a member of the ANC and its military wing, MK, who was abducted from his hideout in Swaziland by an apartheid death squad in August 1986 and taken across the border to South Africa, where his interrogation and torture began. It was not long before September began telling his captors about his comrades in the ANC. By talking under torture, September underwent changes that marked him for the rest of his life: from resister to collaborator, insurgent to counter-insurgent, revolutionary to counter-revolutionary and, to his former comrades, hero to traitor. 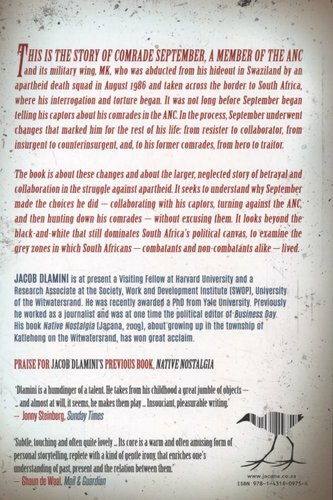 The book is about these changes and about the larger, neglected story of betrayal and collaboration in the struggle against apartheid. It seeks to understand why September made the choices he did - collaborating with his captors, turning against the ANC, and then hunting down his comrades - without excusing those choices. It looks beyond the black and-white that still dominates South Africa's political canvas, to examine the grey zones in which South Africans - combatants and non-combatants - lived. 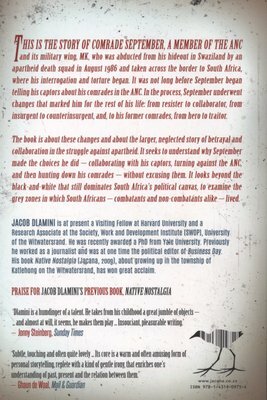 As the book demonstrates, September's acts of betrayal form but one layer in a sedimentation of betrayals in which September himself was betrayed by the Swazi police for sure and may, in fact, have been sold out to the Swazis and the South African security police by his own comrades in the ANC. This, then, is not a morality tale in which the lines between heroes and villains are clearly drawn. The book does not claim that the competing sides in the fight against apartheid were moral equivalents. It seeks to contribute to scholarly attempts to elaborate a denser, richer and more nuanced account of South Africa's modern political history. 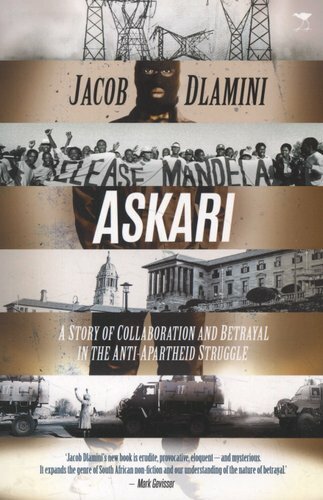 It does so by examining the history of political violence in South Africa; by looking at the workings of an apartheid death squad in an attempt to understand how the apartheid bureaucracy worked; and, more importantly, by studying the social, moral and political universe in which apartheid collaborators like September lived and worked. This is not a biography - a cradle-to-grave account of September's life - even though it does, where necessary, look at his life. September was not the first resister-turned-collaborator. But he was also no ordinary collaborator. That is why his story deserves telling.